But I have missed out on those peaches twice. They’re late boomers, arriving weeks after stone fruit hits the farmers’ market. Like I did summer this year and most years, I wait patiently for the fruit to appear. Why does the tree make me wait? And then, all of a sudden, during the last week of August, the peaches come and go as fast as late summer passes. And I miss out. Last year, I missed out for no good reason; this year, I missed out because old neighbors seemed to have gone up there and taken them. ALL of them. Both years, I’ve been left with sticky, rotten fruit, peppering the ground like miniature smashed jack-o’lanterns the morning after Halloween. They taunt me: “Had you acted faster, my dear, we wouldn’t have seen this fate.” They benefit the bugs and the soil instead. I’ve had this dessert in mind since last year when I discovered the tree. I would pick those fruits, eat a few over the sink, and use the remainder for something minimally processed, for these weren’t any peaches; these were my peaches—the most local peaches I would ever have. Too local for pie, too local for even a modestly dressed crisp. These peaches were meant for the grill: They’d get some flavorenhancing heat and char without taking on a too-cooked flavor. 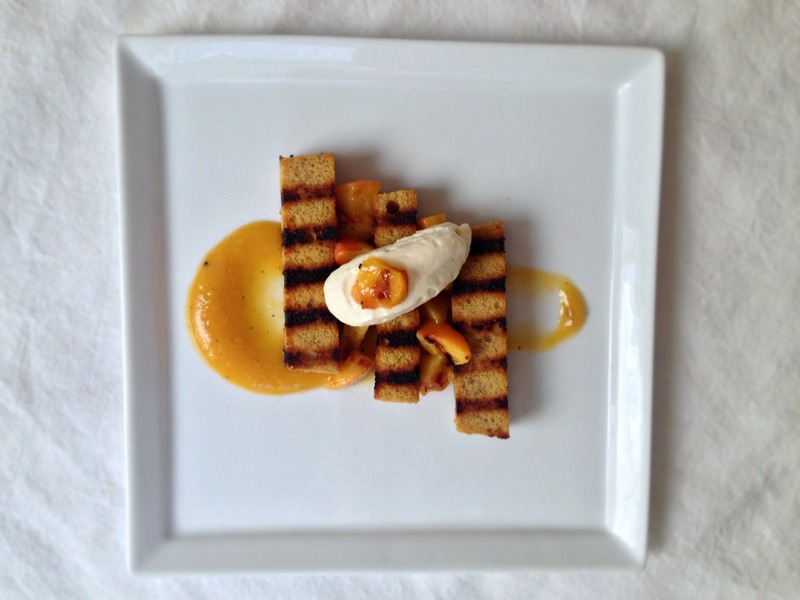 That’s when the grilled brown sugar pound cake and mascarpone came to mind. It wasn’t until this summer that the coffee idea went into the mix. I was simply eating coffee ice cream and thought: Coffee would go great with peaches. Thank goodness it does. These peaches, like summer, were here for only a hot minute. I didn’t use them like I had hoped to. But, like last year, I shout, “FYI, It’s Still Summer”, and I refuse to mourn its end or utter that 7-letter word (it begins with a “p” and white girls love it in their lattes). It’s here until September 22nd, and its bounty is still impressive. So there will be other peaches. They just won’t be my peaches. Better luck next year. 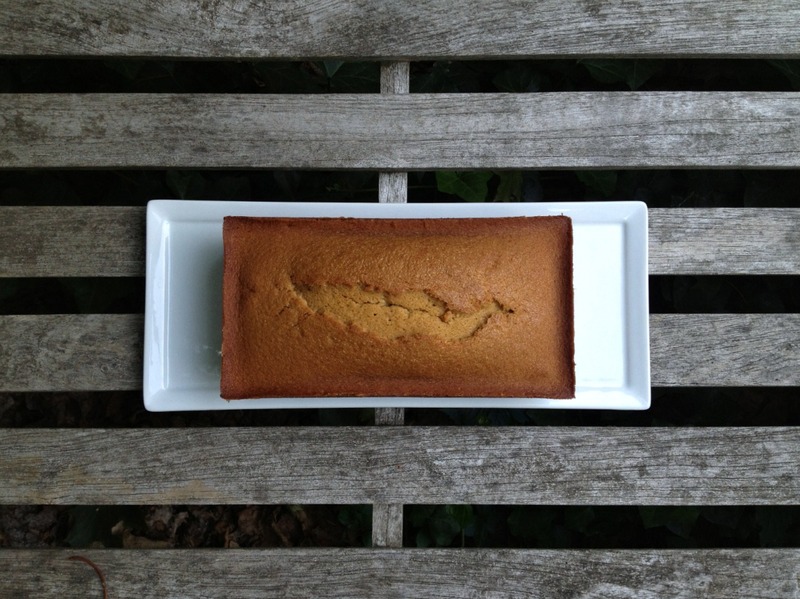 I got the idea to use reverse creaming for this pound cake from Rose Levy Beranbaum. No more tough pound cakes! I used an 8½ by 4½-inch loaf pan. If you use a 9 by 5-inch pan, start checking the cake for doneness early (the cake with be more squat). If you use an 8 x 4-inch pan, the cake will likely take longer to bake. I don’t dictate how many peaches to grill, because I’m not sure if you will be serving the whole cake at once. 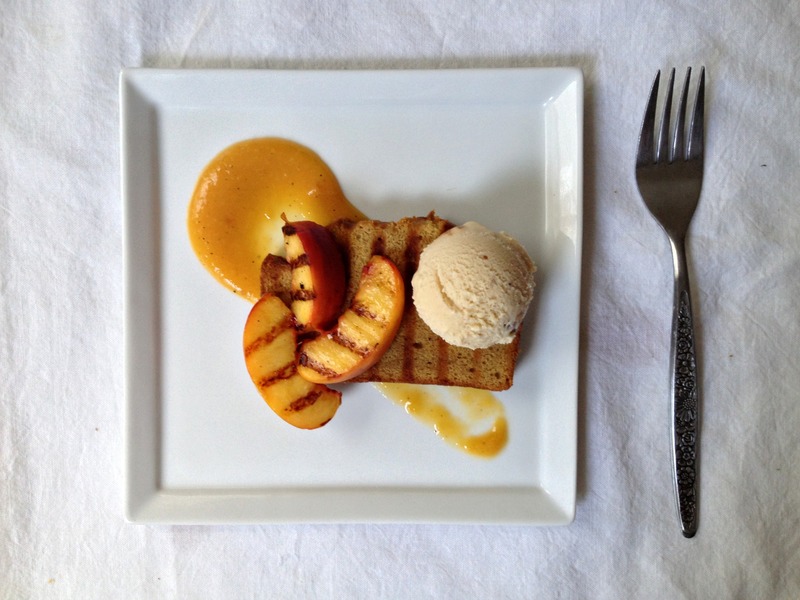 The peach purée, grilled peaches, and mascarpone cream are scaled for serving the whole pound cake, but feel free to reduce these amounts if you’ll be enjoying this just a few pieces at a time. I like the brightness of the peach purée and the freshness of the mascarpone on day one, but the cream can be stored for up to 8 hours and the purée for almost a week. I serve each serving with about half a peach, but if you’re feeling more or less generous, you can use more or less peaches. I like the acidity that the peach purée provides, but if you want a simpler dessert, you can omit that and replace the coffee-infused mascarpone cream with plain whip cream-lightened mascarpone or with ice cream—I like vanilla or butter pecan (shown above). 1. For the Coffee-Mascarpone Cream: Combine heavy cream, coffee beans, and salt in small saucepan and scald over medium heat. Transfer cream and beans to airtight container and chill for at least 2 hours or up to 8 hours. 2. Strain cream and beans through fine-mesh strainer into bowl of stand mixer fitted with whisk (you should have about 115 grams/½ cup; discard any excess. Add mascarpone and mix on low speeduntil combined, about 30 seconds. Increase speed to medium and then medium-high and whip until soft peaks form. 3. For the Pound Cake: While coffee-infused cream is chilling, adjust oven rack to middle position and heat oven to 350 degrees. Grease loaf pan, line bottom with parchment paper, and grease and flour pan. 4. Sift flour, baking powder, and baking soda into bowl of stand mixer fitted with paddle. Add brown sugar, breaking up clumps well between your fingers, and salt. Mix flour-sugar mixture on medium-low speed until combined and there are no brown sugar lumps (smooth out any remaining lumps with your fingers. 6. For the Peach Purée: Heat grill or grill pan to medium heat and oil grates. Brush peach wedge surfaces lightly with butter. Place on grill and cook until nice grill marks appear, about 2 minutes per side. Let peaches cool and transfer to bowl of food processor and process with lemon juice and salt until completely smooth. 7. To serve: Heat grill or grill pan to medium heat and oil grates. Slice pound cake and brush slices and peach wedge surfaces lightly with butter. Place cake and peaches on grill or grill pan(in batches). 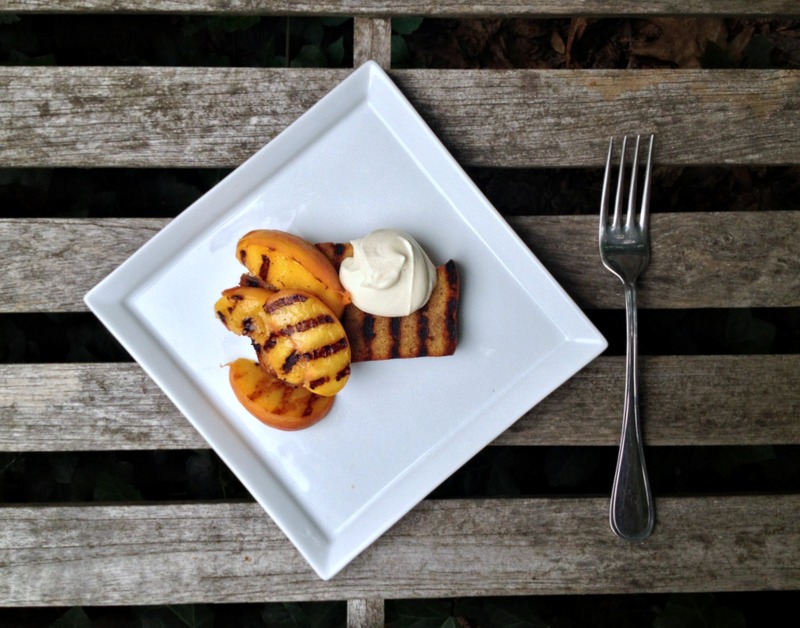 Grill peaches 2 minutes per side, or until browned grill marks appear, and grill cake 1 minute per side, or until browned grill marks appear. 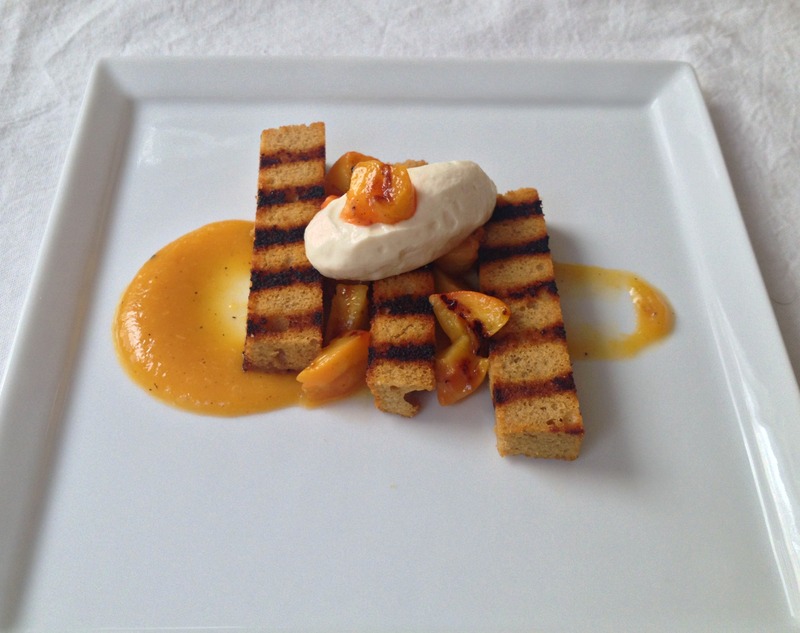 Serve grilled pound cake and peaches warm with peach purée and mascarpone cream. In my adult years I have developed an allergy to stone fruit!! isn’t that sad? But I could still eat this because grilled peaches would be just fine. it looks beautiful and nicely paired with the coffee. That is sad! I guess you can eat them cooked? It is, in fact, still summer, and this is one lovely cake and dessert! Bravo! A peach tree! How nice. I hope you make it in time for harvest next year. I am actually eating a peach right now and hoping I can make pound cake magically appear in front of me. I wish my blog had that kind of power! Oh, *@%#. What selfish neighbors! Clearly you rallied, though. What a lovely dessert. I, too, refuse to use the “P” word. Mainly because (even though I love the real thing … however, only much later in fall), the very thought of those lattes makes me want to barf. Ugh, yes. It’s not even just because I get sad about summer ending. I just don’t understand how the drink can possibly be enjoyable. Well, or most things that Starbuck’s and others pour into coffee cups. I’m so glad! I’m going to do try to do that more since your can eat a lot of desserts in many different ways.